Testing is an important part of the medical field. It plays a crucial role in diagnostics. A total protein assay kit helps doctors analyze what is going on with their patients. Whether the doctor is conducting a routine health check, investigating unexplained weight loss or fatigue, or checking for kidney or liver disease, a protein test is necessary. The accuracy of the kit can make a huge impact on a patient’s life. The right total protein assay kit varies from lab to lab. To see if ITSI-Bioscience protein assay kits work for you, learn more below. The Lowry protein assay method has been around since the 1940s, thanks to Oliver H. Lowry. Out of all the important medical papers published throughout time, Lowry’s work on this method is the most cited. The Lowry method is based on the reaction of copper ions to peptide bonds. Unfortunately, this method is affected by the presence of other chemical compounds in the mixture. Many of today’s protein assay methods are modified versions of the Lowry method. Compared to the Lowry method, the Bradford method is newer, developed in 1976 by Marion M. Bradford. This method is affected by the pH balance of the mixture, and depends on the amino acids of the proteins. With the Bradford method, dye binding is used to analyze results. This method is less susceptible to other chemicals present in the mixture, which makes is preferable to the Lowry method. Unfortunately, the amount of buffer present can affect the outcome. If a new assay method is not based on Lowry’s, it’s likely based on Bradford’s. While the Lowry and Bradford methods are important, foundational scientific breakthroughs, some biochemists complain that they are outdated. Biochemists have to consider the content of their sample before deciding which is best. Most labs prefer a kit where outcomes are less susceptible to their buffer system, that can analyze small samples, and aren’t affected by other chemical compounds that may be present. The ITSIPrep Bradford Total Protein Assay Kit is based on the Bradford assay method but is optimized for better performance. Not only is it more sensitive than the traditional Bradford method, but it is more tolerant of most buffer systems. Users find our kits are more consistent than the standard Bradford array and faster than the Lowry array. The results can be reproduced and the reagents are ready to use. These kits are cost-effective for medical labs, providing the lowest cost per sample compared to other kits. They are also easy to use, so there’s no need to use your best manpower. These kits include all quanti-protein and curve reagents, curvettes and microtiter plates, assay tubes, and an easy to use protocol. You can find this kit in two assay quantities: a cheaper one for 20 assays, and a good value for 96 assays. The ITSI-Bioscience protein assay kit is constructed with convenience, available protein, various mixtures, and accuracy in mind. Is your lab is looking for an effective total protein assay kit? If so, don’t hesitate to contact us to learn more about our products. Posted 3:27 pm by wp-admin & filed under Application Notes. QuantiGene Plex is a powerful tool. The right QuantiGene service can aid drug discovery and development. It can be a great addition to your lab’s tools for clinical research. Notice we said the “right” QuantiGene service. How can you tell the difference between the best QuantiGene services and the ones you should avoid? That’s exactly the question we will answer in this guide. Read on to peruse our checklist for picking the right QuantiGene Plex service. We’re not going to play favorites when it comes to mentioning specific services. Instead, we’ll show you what to look for in a QuantiGene service. Once you know what to look for, you can make an informed decision for yourself. Take a look, and begin your education. You’ll be a QuantiGene expert in no time. The point of QuantiGene is quantity. The word factors into the name of the service itself. Thus, you want to guarantee you’re finding a QuantiGene service that can measure as many genes as possible. A good QuantiGene service should have the equipment to measure up to 80 genes. RNA purification has its uses. Involvement in branched DNA assay does not have to be one of them. We see RNA purification as an extra, unnecessary step in the assay. Many QuantiGene Plex companies see it the same way. That’s why they offer their services without the need for RNA purification. When a service does not require RNA purification, it can work with degraded tissues and directly with blood. All of these things simplify the workflow, making your research easier and clearer. You’re going to use your QuantiGene Plex assay to create pathway-themed and disease-themed panels. These are complex panels that require analysis of multiple genes. You can’t run a disease panel when you only have a few genes to validate against. You choose should choose a service that has an in-depth inventory of validated genes. This will give you the most thorough assay. It’s reasonable to expect your QuantiGene Plex service have an inventory of thousands of validated genes, and not low thousands. We’re saying around 15,000 genes is the ballpark you want to be in. Finding a service that can create custom panels quickly is just good sense. You want a QuantiGene service that can be a true partner to your lab. If you need a custom panel, your QuantiGene service should oblige. Custom panels are always going to take longer than standard panels to create. You should expect a little extra wait time. We think within a couple weeks is a reasonable standard. Forgive the terrible pun, but it points to a truth. If you choose a high-quality QuantiGene Plex service, your research will grow stronger. We hope this guide has given you insight into how to find that service. A lot of your search should be about quantity. Can they measure a lot of targets, and do they have a large inventory? If the answers to those questions are both “yes” and they can do their work quickly, you’ve got a winner on your hands. Check out our services for more in-depth help with QuantiGene technology. Posted 4:17 pm by wp-admin & filed under Programs & Events. The human body functions in amazing ways to keep foreign invaders from entering. Upon detection, immune cells act to neutralize and remove pathogens. They tag them as dangerous, endocytosis, phagocytosis, and pinocytosis. Blood proteins called antibodies essentially sniff out specific antigens, discerning between self and non-self particles. Then, they appropriately dispose of them. Unfortunately, the body gets mixed up sometimes and begins to produce antibodies that don’t make this crucial discernment correctly. As a result, they attack healthy cells. We see this in autoimmune diseases, such as systemic lupus erythematosus (SLE). SLE is a chronic inflammatory autoimmune disease characterized by inflammation that affects the skin, muscles, bones, heart, lungs, and peripheral nervous system. With this disease, keratinocyte, and monocyte apoptosis increases along with the Fas ligand expression in T and B cells and T cell necrosis. Antibody research revealed that one of the most important nuclear antibodies for diagnosing autoimmune diseases in clinical practice is the anti-Sm antibody. Let’s look at the specifics on the anti-Smith antibody and its clinical importance regarding SLE. In some individuals suffering from lupus, dead cells release the anti-smith antibody. It combines with anti-RNP antibodies to form a self-reactive B cell protein complex. Why Is It Clinically Important in Diagnosing SLE? The anti-Smith antibody is present in about 20-30% of patients. Most of these patients are Asian and African American. A higher percentage of patients with SLE present with anti-RNP antibodies. However, doctors find that the anti-Smith antibody test more accurately diagnoses the disease because this antibody doesn’t tend to present in other rheumatological afflictions, whereas anti-RNP does. When Is It Appropriate to Test for Anti-Smith Antibody? You can also use this antibody test to help diagnose mixed connective tissue disease. Test results will read as positive, equivocal, or negative and will typically come through in about 5-7 days. A doctor may run this antibody testing instead of or in conjunction with the Antinuclear Antibody test, the Antiphospholipid Antibodies test, the Anti-dsDNA test, the C-Reactive Protein test (CRP), and a complement test. Can We Counteract the Anti-Sm Antibody? A C-type lectin with two identical halves, called CD72, provides hope for effectively battling SLE without causing significant damage to other cells. Research shows that the regulatory protein CD72 actually inhibits the complex formed by anti-sm and RNP antibodies by binding to it. If your patient presents with signs and symptoms of SLE, put together your panel of lab tests with only the most trusted products and equipment available. Remember the clinical importance of the anti-Sm antibody when putting together the panel. Contact us for all of your biomedical research kits, genomics, and proteomics and mass spectrometry services. Proteins are one of four macromolecule building blocks that are necessary for any form of life. That’s why being able to analyze proteins with a protein assay is crucial in both research and diagnosis. Total protein assay kits can be used to determine the total protein concentration of a sample. To help you choose the right method to measure your protein, read this review of the main protein quantification methods. This colorimetric, two-step protein concentration assay was first developed in 1985. It is relatively young compared to others, such as the Lowry assay. First, complex the protein by using copper ions. Next, the copper that is now bound with the protein will give off a vibrant purple hue. The shade of purple corresponds to the amount of protein in the sample. Then, compare the sample to the standard curve to determine the protein. The BCA assay is a good choice if your protein sample has less than 5% detergents. As this method relies on copper, certain chemicals can interfere with the BCA assay, such as ammonia. Bradford Assays bind the protein to Coomassie dye in acidic conditions. As a result, the color changes from brown to blue. When the Coomassie dye binds to the amino acids in the protein, it becomes blue and absorbs at 595 nm. The absorption in your sample can then be compared to a standard curve to determine the protein concentration. This method is simple, fast, and stable for around 60 minutes. Keep in mind that it only works on proteins larger than 3 kDa. Unlike the BCA, the Bradford is sensitive to certain detergents, such as SDS and Triton X-100. The Folin-Lowry is a reliable and time-tested protein quantification that dates back to 1951. This has two steps. Step one: complex copper with nitrogen found in your protein. Step two: the now complex tyrosine and tryptophan will react with the Folin-Ciocalteu phenol reagent to give off a greenish blue shade that absorbs at 650-750 nm. The great thing about this assay is that the results are stable. So you can estimate how much protein is in your sample by comparing it with a previous standard curve. The downside of this assay is that it is incompatible with many chemicals and reducing agents. In a liquid chromatography protein concentration assay, the sample is transported through an absorbent column by a solvent at high pressure. Each amino acid side chains will react differently. The ones that react least will move down the column more quickly than the side chains that react the most. As fractionated proteins flow out of the column, each fraction is identified either by UV spectrometry or by mass spectrometry. A dye can be used to make detection easier. Thanks for reading. We hope you found this list of the various commonly used protein assay quantification methods useful. Next, check out ProDM, a kit for tryptic digestion monitoring for a successful shotgun proteomics. ProDM – A Colorimetric Kit for Rapid Monitoring and Standardization of Tryptic Digestion for Improved and Reproducible Shotgun Proteomics was presented at the US HUPO 9th Annual Conference March 10 – 13, 2013. ITSI-Biosciences is pleased to announce that Concurrent Technologies and Services (CTS) and Biomax Co, LTD have been selected as the 2011 “Most Outstanding Distributor of the Year” and “Best New Distributor of the Year”, respectively. Percent increase in sales from the previous year. Total value of products ordered. Timely communication of market intelligence and customer feedback to ITSI-Biosciences. To win the award, a distributor must place first in at least three of the four categories. Concurrent Technologies Nigeria Limited achieved the highest score for total annual product sales, percentage increase in sales for the past 12 months and the variety of products ordered. Funakoshi of Japan, the winner in 2010 and 2011 placed second overall. Biomax Co Ltd of South Korea won the “Best New Distributor” award. 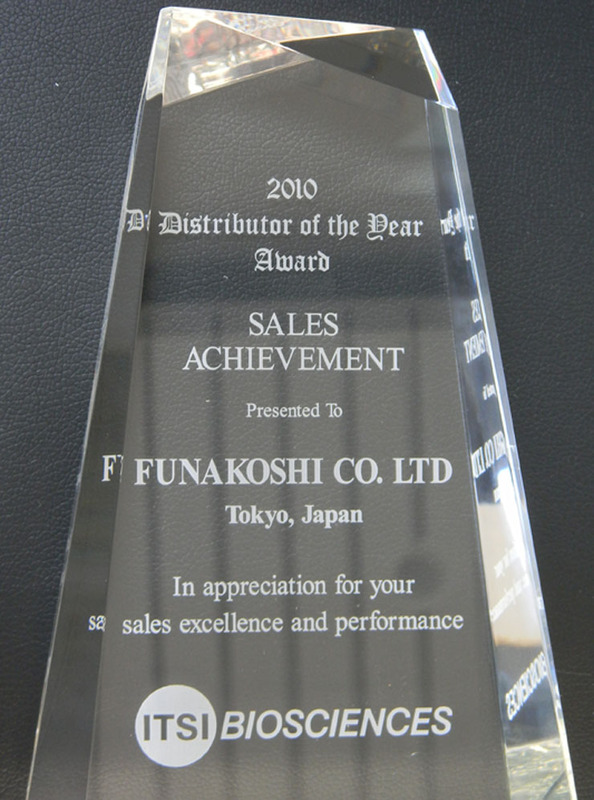 This award is given to a new distributor who has demonstrated a high level of commitment towards the promotion and selling of our products in their territory. To win the award in the year they were appointed, a distributor must place first in at least two of the following three categories; a) Total value of the products ordered, b) Variety of products ordered and c) Timely communication of market intelligence and customer feedback to ITSI-Biosciences. In appreciation of their efforts, CTS and Biomax will receive our authentic 2012 Distributor of the Year Award, a certificate and an additional 15% off on all confirmed orders for ITSIPrep Bioanalytical Kits and ITSIPrep Accessories placed with ITSI Biosciences during the month of April 2012. ITSI-Biosciences congratulates Concurrent Technologies Services and Biomax Co. LTD for this well-deserved award and look forward to continue working with them to increase our market share. Johnstown, PA ITSI Biosciences is pleased to announce the introduction of a unique line of space-saving laboratory instruments ideal for laboratory and field use. This new line includes the ITSI Vortex Mixer and the ITSI Magnetic Stirrer for use in laboratories and field research. Both units operate with a small electrical (6V) adapter or batteries (4×1.5v). Each weighing only 200g, they are small, light weight and portable. The ITSI Vortex Mixer and Magnetic Stirrer allow for easy movement around the laboratory with no cable clutter. “You will hardly know they are on the bench until you need to use one. Being battery operated and compact makes these units ideal for field use and for laboratories with limited bench space” says Dr. Richard I. Somiari, President and Chief Scientific Officer. The Vortex Mixer and Magnetic Stirrer can be purchased online at www.itsibio.com or by calling ITSI Biosciences (814)262-7331. ITSI-Biosciences (www.itsibio.com) today announced that Cheryl Napier, M.S is the lucky winner of the Acer Net Book that was displayed at ITSI- Biosciences booth during the 2010 American Association for Cancer Research Annual Meeting in Washington D.C from April 17 – 21. Mr. James White, Economic Development Coordinator for the City of Johnstown, PA drew the lucky entry from over 100 entries. 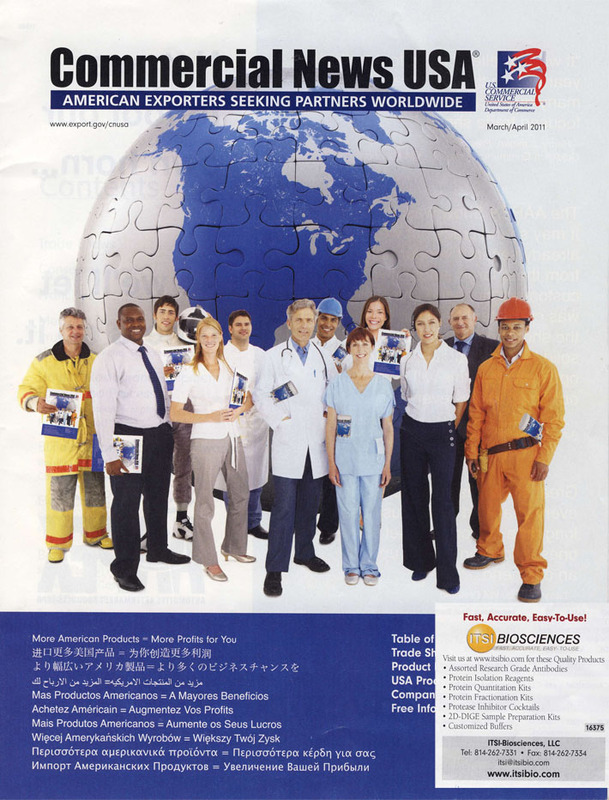 ITSI-Biosciences featured in Commercial News USA, the official export magazine of the U.S. Department of Commerce. Commercial News USA is the premiere export promotion program for promoting U.S. goods and services in more than 178 countries around the world. The catalog-style magazine reaches more than a quarter million buyers and distributors worldwide. The magazine is direct-mailed to subscribers around the world, and also is distributed at U.S. embassies and consulates, as well as at major trade shows. In addition to us being included in the print edition, we receive a free listing, email and Web links in both the pdf and html versions of the magazine on their Web site. Two PhD Research Fellows from Olabisi Onabanjo University, Nigeria, arrived in Johnstown, PA today to commence research programing at ITSI – Biosciences. The two students will be in the United States for 6 months researching on Sickle Cells and Breast Cancer. Chuck Witkowski founder of Protein Discovery visits ITSI-Biosciences facility today. Mr Witkowski is is a visionary leader with demonstrated expertise in building successful medical and life science companies from inception. “ITSI – Biosciences host summer interns”. Five students will be at ITSI – Biosciences for 7 weeks as interns. Three are high school graduates; Nicole Danchanko that will be going to Penn Highlands Community College in the fall to study Biology, Richard Somiari Jr going to Lehigh University also in the fall to study Computer Engineering and Jamie Lepsch going to Robert Morris University to also study Computer Engineering. Two are college students; Zach Evans a sophomore from the George Washington University majoring in International Affairs, Jasmine LaRue majoring in Biology at Mount Aloysius College. ITSIBIO today announced that Nigerian Defence Headquarters Research and Development leaders, Major Gen BT Obasa (Chief, Research & Development) and Air Vice Marshall A Badeh (Director of Research) and Dr Richard I. Somiari (President & CSO) ITSI – Biosciences, LLC toured the Nigerian Armed Forces DNA Bank at Mogadishu Barracks, in Abuja, Nigeria. ITSI Biosciences is helping the Nigerian DHQ develop a Genvault technology based DNA bank capable of banking DNA from 100,000 military personnel. A total of 6 AFDB personnel are currently undergoing DNA banking and analysis training at ITSI Biosciences, Johnstown PA. As part of the training, the AFDB personnel have also spent time at Indiana University of Pennsylvania, Indiana, PA, Cybergenetics, Pittsburgh, US Armed Forces DNA Identification Laboratory (AFDIL), Rockville, MD. The visit was to assess the readiness of the facility to receive the trainees who will return to Nigeria in April 2010. ITSIBIO today announced that 6 Nigerian AFDB personnel visited the United States Department of Defense (DoD) Armed Forces DNA Identification Laboratory (AFDIL; www.afip.org/consultation/AFMES/AFDIL/index.html) in Rockville, MD and Armed Forces Repository of Specimen Samples for the Identification of Remains (AFRSSIR; www.afip.org/consultation/AFMES/AFDIL/AFRSSIR/) in Gaithersburg, MD. The visit is part of the comprehensive forensics DNA banking and analysis training organized by ITSI Biosciences, Johnstown, PA for the Nigerian Armed Forces DNA Bank and Analysis personnel. The visit allowed the AFDB personnel to tour both facilities and observe first-hand how DNA is collected, stored at room-temperature and analyzed by the US military in support of military missions. ITSIBIO today announced that instructors from AFDIL based in Rockville, MD have arrived Johnstown, PA to help train Nigerian Armed Forces DNA Bank (AFDB) personnel. The AFDIL team led by Michael D. Coble, PhD (Research Section Chief) arrived in Johnstown, PA on the 8th of December 2009. According to Richard Somiari, PhD, President of ITSI, LLC Ã¢â‚¬Å“the training will focus on military applications and cover; 1) Forensic DNA Analysis 2) Short Tandem Repeat (STR) Data Analysis and Interpretation 3) Population Genetics and Statistics and 4) Non-STR DNA Markers. ITSI LLC (www.itsi.us; www.itsibio.com) is helping AFDB setup a state-of-the-art DNA banking and analysis center in Abuja, Nigeria that will be capable of banking DNA from up to 100,000 military personnel. The involvement of AFDIL in the training program is critically important and key to achieving the overall project goalsÂ added Dr Somiari. ITSIBIO today announced its movement into its new and larger facility. The new state-of-the-art facility in the Kernville district of Johnstown, PA is a green building with a silver status. The new facility includes more office space, expanded research laboratory and kit manufacturing space, and an ISO Certified Class 1000 clean room. This move is another step in our company’s growth strategy states Richard Somiari, PhD, founder and president of ITSI Biosciences. ITSIBio continues to be successful in delivering innovative services, developing easy-to-use sample preparation kits and securing competitive grants for cancer biomarker development. ITSIBIO today announced the introduction of a new and improved packaging for its distinctive line of ITSIPrep products. The new colorful and distinctive packaging is a marketing tool that reflects the key attributes of ITSIPrep line of products. This new packaging replaces the plain white package that the company has been using for three years. According to Richard Somiari, PhD, President of ITSI Biosciences this new package will distinguish ITSI Biosciences products, and provide better protection to the contents during shipment of our innovative products to customers in the USA and around the world. ITSI Bioscience has announced that it is a Subrecipient of a $2 million 5 year RO1 grant awarded to Dr Karam El-Bayoumy of Penn State University Cancer Center. This NCI subaward will fund proteomics research at ITSI Biosciences, focusing on the identification of biomarkers of prostate cancer risk. Specifically, ITSIBio will utilize high performance 2D-DIGE MS and nano-LC/MS/MS to identify and characterize redox-sensitive proteins, and global proteomic patterns associated with the form and dose of selenium administered to human subjects, and those associated with the age of the subjects. Dr. Richard Somiari, the founder of ITSI Biosciences, a life-science enterprise in the Johnstown region, is preparing to move his company into its new headquarters by year’s end–just in time to expand field investigations of a blood-sampling method that promises to increase the speed and lower the cost for early detection of breast cancer. That work received a $100,000 Small Business Innovation Phase I Research Grant from the National Cancer Institute in July. After what appears to be a long search for the right space, ITSI-Bio’s third move promises to be a charm for a four-year-old business that represents a bellwether for the efforts to attract a cluster of life-science enterprises to the Johnstown region. “We’ve been carrying on our work in about 1,500 square feet and need the flexibility of a custom-built laboratory,” Somiari says from his present location in the Kernville neighborhood of Johnstown, Cambria County. The new location will place the company, which provides analytical services and sampling kits for bioscience laboratories worldwide, in a 10,000-square-foot facility nearer the heart of Johnstown. ITSI-Bio will initially occupy half of that area, where it will be able to broaden its basic analytical services to bioscience researchers. In addition to analytics, the company also offers kits for isolating, handling, testing, and monitoring proteins, as well as reagents used to tag biochemical reactions. “That business has kept the doors open while we have pursued our method for early breast cancer detection,” Somiari says. The detection protocol draws upon about 20 biological markers, some of which have been clearly associated with breast cancer and others that Somiari has identified for the blood-sample analysis that he hopes to demonstrate as a faster and more precise testing method. While that goal has directed his passion as a scientist, he has been closely identified with the future of biotech in Johnstown. He came to the region from the University of Maryland in 2000 to start the Windber Research Institute, the region’s first biomedical research institute. Only later did he form his own company to develop a commercial product–deciding, as he says, that it would be a good idea to practice the entrepreneurship that he had been preaching. The NCI grant will finance expansion of the breast-cancer-test sampling and independent validations of results through UPMC McGee Hospital, Indiana Regional Medical Center, and the Department of Biomedical Informatics at the University of Pittsburgh. It will also support the development of algorithms to analyze results, as well as development of a Phase II NCI grant for up to $1 million. ITSIBIO has signed a representation and distribution agreement with Precision Technologies PTE Ltd, Singapore (www.pretech.com.sg). This agreement, which is effective March 17th 2008, gives Precision Technologies exclusive rights to promote, market and distribute ITSIBIO products in Singapore, Malaysia and Indonesia. Clients in this territory can now place orders for all ITSIBIO products through Precision Technologies. Orders can be place by Phone: +6273-4573, Fax 6273-8898 or E-mail: scitech@pretech.com.sg. ITSI signs an exclusive distribution agreement with Funakoshi Japan. Funakoshi will promote, market and sell the ITSIPREP™ line of products in Japan. ITSI signs an exclusive Representative and Distributorship agreement with Rainbow Biotechnology Co., Taipei, Taiwan. Rainbow will promote, market and distribute the ITSIPREP™ line of products including optimized and easy-to-use kits for protein isolation, protein fractionation, protein precipitation, albumin removal and protein assay.